This is a corner of my studio in the Artist Studio Building on Congress Street in Portland. I highly value being part of the community within this building, as it is full of support and feedback if you ask for it. 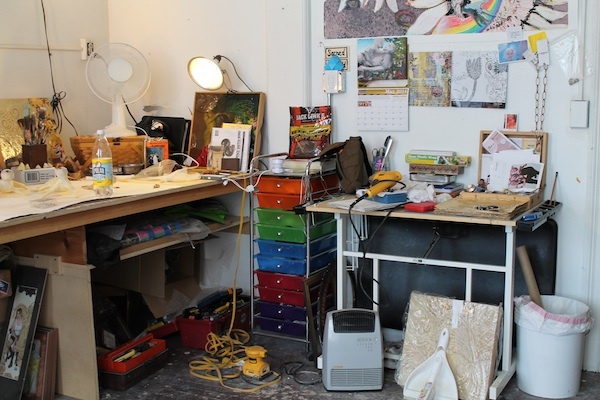 Except for the wall opposite this photograph, the rest of my studio is as cluttered as this. I usually work with a sense of immediacy and in the fashion of bricolage, so having a great variety of “stuff” is essential. My treasures range from glass prosthetic eyes, to handmade oil paints, to a rotating and musical Christmas decoration. In this room I am prepared to play. 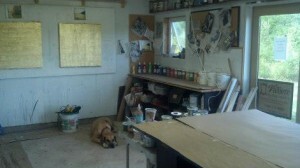 Before building this studio in Rockland, my previous studios were either on the kitchen table or in a spare bedroom. I find that with my personality, working in that kind of an environment stifles my creative process. When building this studio, we purposely left it unfinished with raw sheet rock over insulation, no moldings, and a concrete floor with an old carpet remnant laid over it. In this environment I am not worried about being neat. I can paint without holding back. At the end of the day, I close the door behind me, leaving my lovely chaotic mess hidden and waiting for me the next morning. I also love that this studio is attached to my home on thirty acres, where my beloved dogs can hang out with me all day, I can play my music or books as loud as I want, and I only have to walk out my door for inspiration. 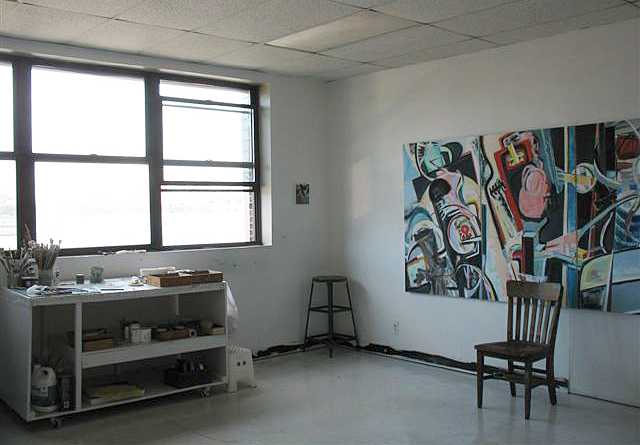 My Brooklyn Navy Yard studio has been a major influence on my work. 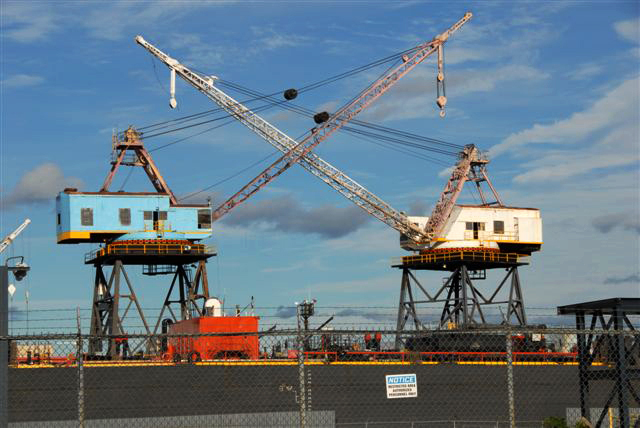 I look out over a dry dock, in use when I first came, now idle, and beyond that I see the East River, the Manhattan skyline, bridges, barges, tugs. The immediate area is a changing scene of giant rusting cranes and all sorts of other objects whose uses I can only guess at. 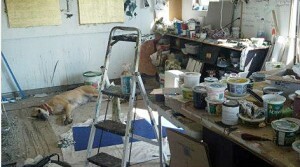 For an abstract painter to find herself in such an abstract landscape is both unsettling and tremendously exciting. Is a depiction of a twisted bit of metal, abstracted from its original purpose, an abstract painting? Of course, it is not the category that is important. But for me, the constant confusion and resolution and re-confusion of objects in a complicated array is at once a stimulus, a problem that is always fresh, and a means for the development of a pictorial language.